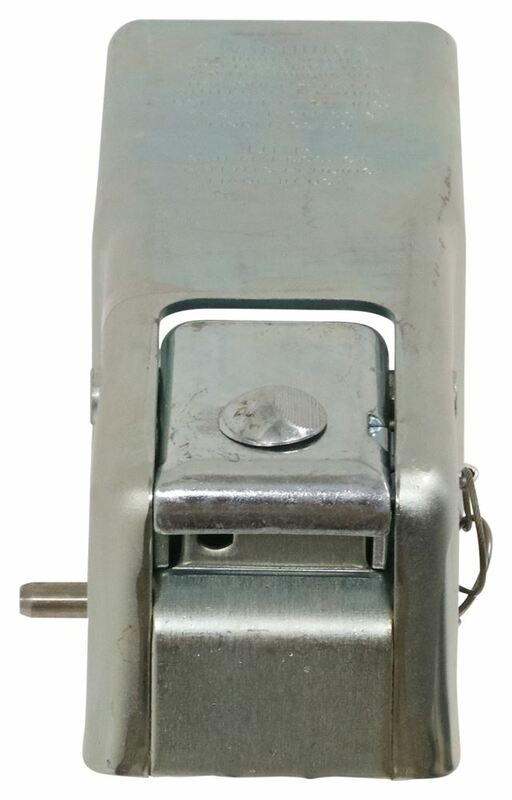 Corrosion-resistant, straight-tongue trailer coupler features an adjustable, trigger-style latching mechanism that securely locks in place around hitch balls measuring 1-7/8", 2" and 50 mm. Lowest Prices for the best straight tongue trailer coupler from Titan. 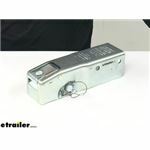 Titan Zinc-Plated, Leverlock Coupler - Adjustable Ball - 3" Channel - Bolt On - 5,000 lbs part number T4845000 can be ordered online at etrailer.com or call 800-298-8924 for expert service. Corrosion-resistant, straight-tongue trailer coupler features an adjustable, trigger-style latching mechanism that securely locks in place around hitch balls measuring 1-7/8", 2" and 50 mm. Titan's unique Leverlock latch comes preset to fit 2" hitch balls, but can be adjusted to also fit balls measuring 1-7/8" and 50 mm. Simply use a 3/4" socket wrench to turn the locknut beneath the latch and change the fit. The popular and efficient, trigger-style latch on this corrosion-resistant, straight-tongue coupler helps to make hookup quick, easy and secure. The easy-to-use turn-wheel latch on this corrosion-resistant trailer coupler adjusts to fit 1-7/8", 2" and 50-mm hitch balls. 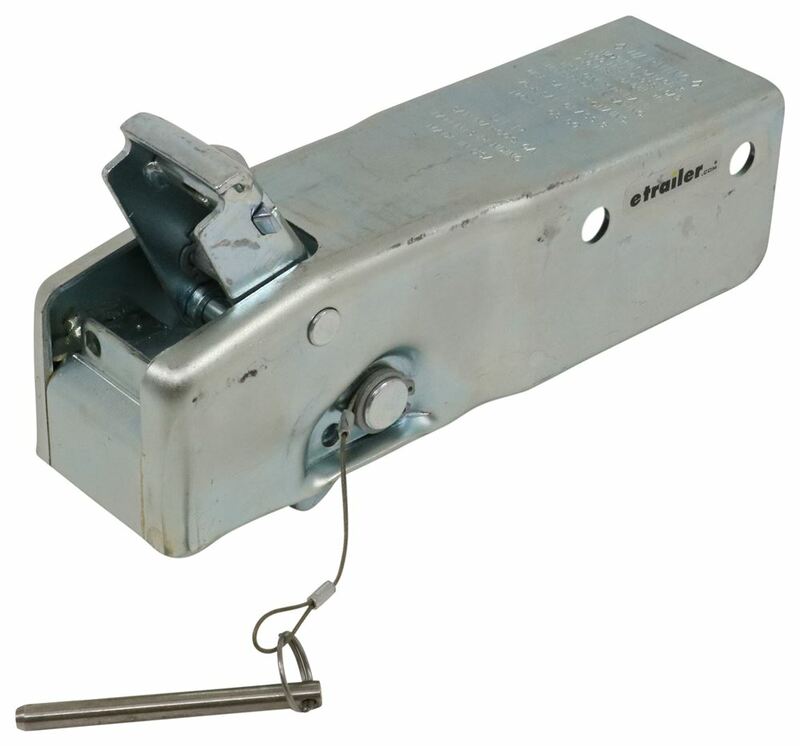 Today we're taking a look at the Titan Zinc Plated Lever Lock Coupler.Now this unit mounts to your trailer and allows you to connect your trailer to your tow vehicle.The lever lock coupling mechanism ensures easy, secure connection to a two inch hitch ball.So basically when you're ready to use it, what you'll need to do is you'll need to remove the included pin, it's tethered on there so you don't misplace it or lose it. That can be replaced with a locking pin if desired. But then you slide this ball, it's like a half ball right here, you put your finger on the finger indention area, slide it over and then lift up the lever.Now that fully opens the coupler to receive a two inch ball. Once the ball engages, it will push back down that lever, it will click into place. 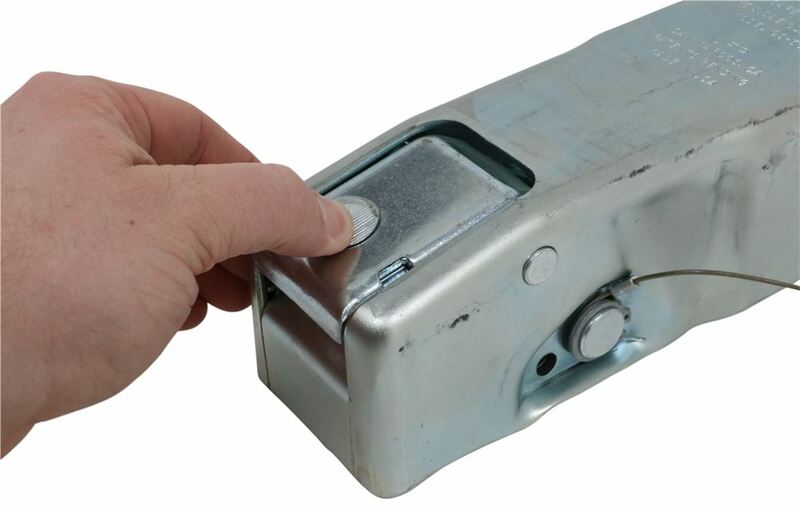 That audible click lets you know that it's fully engaged and you're ready to reinstall your pin and get on the road.Now the unit itself is made from a durable steel construction with zinc plating to resist rust and corrosion, it's a bolt on installation, two mount holes on each side of the unit. Parts are made in the U.S.A.
Again, it's designed for a two inch ball.The space right here, inside edge to inside edge measures about three inches so that lets us know this is for a three inch wide channel tongue. The bolt holes on the unit, these are separated apart from one another on center by three inches and they have a half inch diameter. Mounting hardware not included.All your capacities are engraved right here on the top. So, this unit features a 5,000 pound gross load capacity, 750 pound tongue weight capacity.Then when it comes to the overall length of the unit measuring from the very front to the very back you can see it measures about 11 inches long.That's going to do it for today's look at the Titan Zinc Plated Lever Lock Coupler. 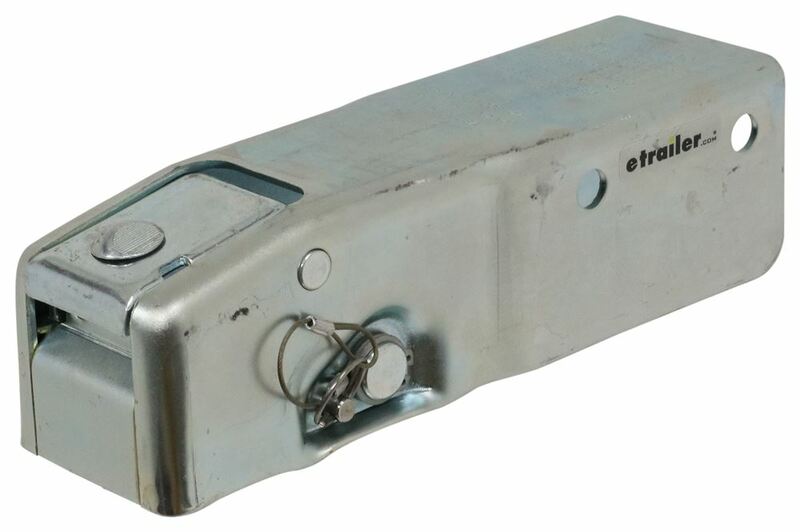 Order: RelevanceNewestRating - High to LowRating - Low to High Corrosion-resistant, straight-tongue trailer coupler features an adjustable, trigger-style latching mechanism that securely locks in place around hitch balls measuring 1-7/8", 2" and 50 mm. 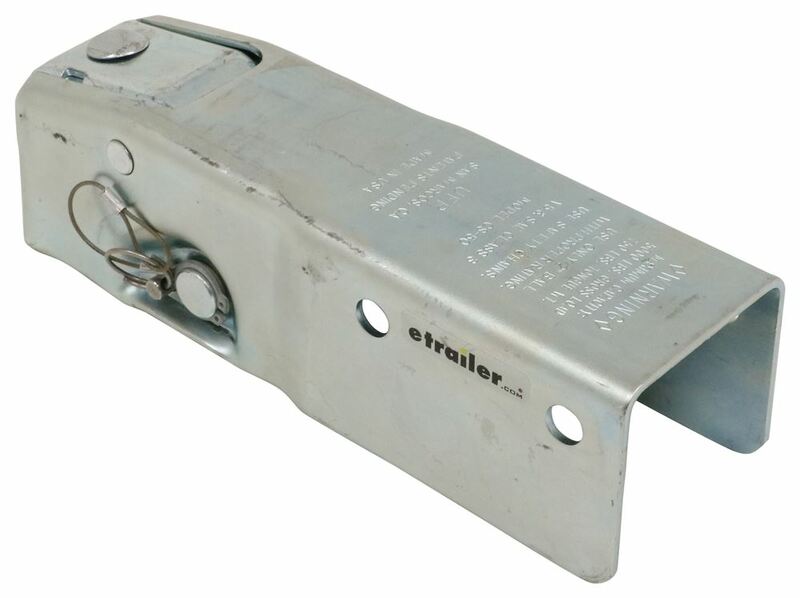 Do you have a question about this Straight Tongue Trailer Coupler? The linked page displays all 2-inch ball couplers that bolt on to a 3-inch trailer tongue. Some do use the same 3-inch hole spacing, such as Titan # T4845000 and the Fulton # F223000301, but other hole patterns are included on some couplers, such as the Demco # 12564 which uses three holes. Yes, as long as the tongue on your Shoreland'r Tadpull Trailer does not exceed 3" wide then you can use the Titan Zinc-Plated, Leverlock Coupler part # T4845000 which is compatible with 50mm hitch balls like part # 63912. It also has a weight capacity of 5,000 lbs so you will need to make sure your boat and trailer do not exceed this. The Titan Coupler is zinc plated for corrosion resistant and comes with a one year warranty. I have attached a review video for you as well. 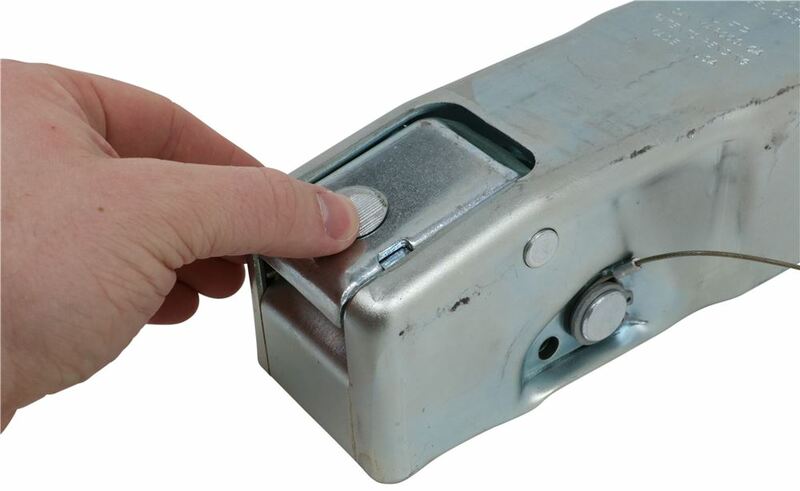 If your current coupler is loose enough that it rattles when connected to a hitch ball it is in need of adjustment or replacement. There should be a nut on the underside of the coupler that holds the latch in place. You would want to tighten that down so that the latch fits tighter to the hitch ball. The Titan Coupler part # T4845000 would also be a great replacement as long as your trailer frame is built on 3 inch channel. This coupler is also made in the USA. A 50mm hitch accessory, such as a hitch ball like # 63912 or # EH53C-C, is slightly smaller than 2-inches, 1.968-inches to be exact. There are multi-fit couplers like # T4845000 and # T2343400183 that will work fine with three hitch ball sizes, 1-7/8-inch, 2-inch and 50mm. The 50mm size did indeed originate in Europe. I recommend using only a coupler that is designed specifically to fit the 50mm ball size. A trailer coupler for a 3-inch channel tongue is still very much available. 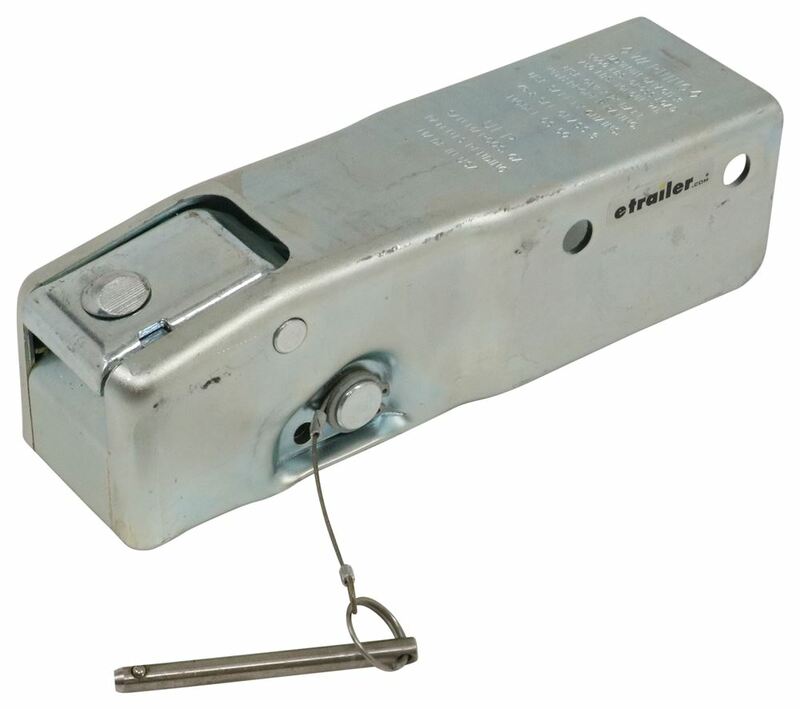 The linked page displays all types of couplers, including the 1-7/8-inch/2-inch ball coupler type such as # T4845000 from Titan that is rated for a 5000-lb trailer and the item you referenced, part # CT-3003-Z. This Titan coupler will work fine with either a 1-7/8-inch ball or a 2-inch ball so you can certainly use a 2-inch ball on your truck. I attached a picture that has all of the dimensions you requested for the Titan coupler part # T4845000 that you referenced. I pulled the Titan Trailer Coupler #T4845000 and the Titan Repair Kit # T4358400 from our warehouse. I produced a short video for you showing how to reassemble the Titan # T4845000. Also linked is an FAQ on trailer couplers. We don't have generic coupler repair kits that I can recommend, but most likely your coupler can be replaced if you take it to a qualified welder in your area. They should have no problem removing the coupler and installing a new one. If your hitch ball is 2 inches the part # F343000301 would work for you. This mounts to a 3 inch channel. If you have a 1-7/8 inch ball you would want the part # T4845000. The Titan Zinc-Plated, Leverlock Coupler - Adjustable Ball - 3" Channel - Bolt On - 5,000 lbs # T4845000 has a height with the lever up of 4-3/4 inches and 5-3/4 inches to the lowest part when that lever is up. I've attached a photo to assist. I recommend the Titan LeverLock Coupler # T4845000. This is an adjustable coupler that will work with 1-7/8 inch, 2-inch and 50-mm balls. This coupler is a bolt-on and has a 5,000-lb capacity. For a coupler that uses a handwheel to tighten the coupler around a hitch ball I recommend part # T2343400183. This coupler will also work with 1-7/8 inch, 2-inch and 50-mm balls, and is a bolt-on installation with a 5,000-lb capacity. I took a measurement for you and the height of the Titan Zinc-Plated, Leverlock Coupler # T4845000 with the trigger latch up is approximately 6". This coupler works with 1-7/8", 2" or 50 mm balls, mounts on a 3" wide tongue, has a 5,000 lb capacity and 500 lb tongue weight capacity. Highest quality straight tongue trailer coupler for the best price. Most detailed, accurate straight tongue trailer coupler information available.